The holidays are here again in Roseville and the Greater Sacramento Area. Do you have an annual tradition of exchanging small gifts with your neighbors over the holidays? Or maybe you’ve just moved and you’d like to give gifts as a way to meet your new neighbors? It’s a wonderful way to show your appreciation to the people who call your neighborhood home. If you’re looking for some fun new ideas, read on. These are some of the best ideas we’ve seen this year for neighbor gifts. If you’re looking for a non-food gift this year, then simmering potpourri can be the perfect choice. This is an affordable option that looks beautiful, is easy to do, and takes almost no time to make. You can gather all the materials in a pretty box or a mason jar, pop on a bow, and voila! These mixes can be added to water and placed on the stove over low heat for several hours. It will make your neighbors’ homes smell so wonderful and can be used several times. You can make them with some simple ingredients that you may already have in your kitchen. These can include dried herbs, spices like cinnamon and clove, citrus fruit peels, and cranberries. Check out some great recipes here. Don’t you hate it when you run out of wrapping paper and tape? Be your neighbors’ savior and give wrapping paper with a roll of tape as a gift. This is a practical and affordable choice that just about everybody can use. And they’ll be glad you saved them the inevitable weight gain of yet another plate of cookies. If you aren’t sure what holidays your neighbors celebrate, opt for a more general-themed or solid color paper. If you want to spend a little more, splurge on some really luxurious handmade papers. If you’d like to score a bargain, hit up the post-holiday sales and buy wrapping paper for next year. Have you ever had a child open a toy that needed batteries – and you didn’t have any? That’s a nightmare scenario everyone wants to avoid. So gift your neighbors some so they have a stash on hand for this holiday season and after. You can buy batteries in different sizes in bulk, and then divvy them up into smaller gifts. Tie them up with a bow and add a tag, and you will be everyone’s favorite neighbor this year for such a creative and useful gift. 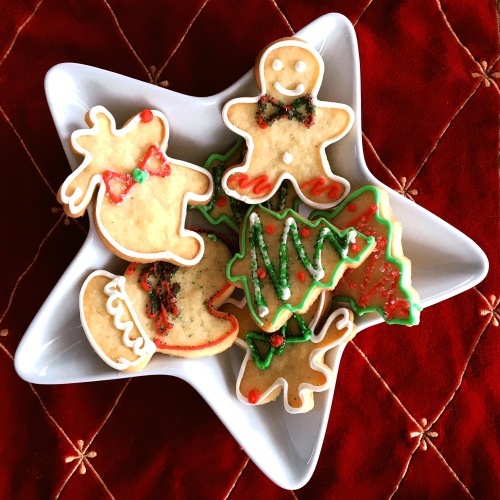 Cookies are the traditional holiday gift for a reason – they’re so darn good! You can always purchase cookies at the grocery store or a bakery if you’re short on time or don’t bake. Buy different kinds then arrange on a festive plate. If you want to make them from scratch, there are tons of great cookie recipes online. You can make a pretty presentation by picking up some vintage plates at the thrift store or holiday-themed plates from the dollar store. Brought to you by your Roseville Real Estate Agent – Chuck Klein. For more information on the Roseville housing market, real estate and homes for sale in Roseville and The Greater Sacramento area, please contact Chuck at (916) 996-6222 or email.